It’s the oath by which you swear to abide. But, what about when it comes to taking care of yourself? Physicians as a whole are notoriously bad at taking time for themselves. They’ll work double shifts, walk rounds until blisters form and legs fail, and give everything they have to every patient … and then remember that they forgot to eat lunch. But, abiding by the Hippocratic Oath should also apply to self care, and self care is at least partially about making sure you’re enjoying a high quality of life. It’s a virtual doctors lounge, therapy couch and professional conference all wrapped up under one URL. It’s SERMO, the top social network for physicians in the United States and around the world. Just what you need right? Another social media platform where people with no actual knowledge about a topic spout off with ill-informed opinions? SERMO has 600,000 verified and credentialed members, so you’ll only be interacting with other doctors. And, you’ll get to discuss whatever you want, ask any questions you need to or commiserate around any topic–because all of the conversations on SERMO are confidential. It really is one of the great physician tools for finding balance, because it lets you blow off some steam, ask sensitive questions, seek counsel on a difficult case or simply get something off your chest. Finally, a fitness-tracking device you’ll actually want to wear. Sure, Fitbits and Apple Watches are fantastic tools, but they can be a bit bulky and cumbersome–especially for physicians. Now there is Motiv, a ring-sized activity tracker, heart rate monitor and sleep sensor that simply slips onto your finger and delivers form, fit and function without being obtrusive. It’s made from ultralight titanium, so it’s durable. It’s waterproof. It’s equipped with a battery that lasts up to five days. And, it comes in slate gray or rose gold. But, most importantly, the Motiv measures your active minutes, active heart rate, calories burned, distance you’ve walked, sleep duration and resting heart rate. It’s one of the physician tools that’s small enough not to be noticeable, but powerful enough to have a big impact on your overall health and wellness. The problem with most truly wireless ear buds is that they don’t deliver exceptional sound quality. Sure, you may be free from the cords that are always snagging buttons, briefcases and purse straps. But, what good is that if you can’t hear what you want to hear? These wireless ear buds have been making big noise in the industry over the past few months, racking up award after award at conference after conference. Not only do they deliver high quality high fidelity sound, but they also allow you to amplify speech, selectively tune out the world around you thanks to super-intelligent noise cancellation technology and blend the best of your digital music with the sounds around you to make sure you have absolute situational awareness. And, they do it all without those pesky cords. Nuheara IQbuds are one of the rare physician tools that can improve the quality of your life both in and out of the office. Taking care of yourself is as important as taking care of patients. Use these tools to make sure you’re at your best. *Elliot Health System does not endorse specific technology highlighted in blogs – all references are for the purpose of awareness of new medical technology only. Did you like this article? 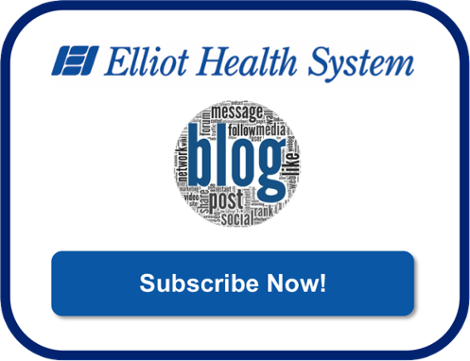 Subscribe to the Elliot Health System blog to read more like it. Bedside medicine relies on practitioners’ quelling the fears that each patient brings into the exam room. The art of medicine is thus an empathetic bedside manner. Yet, as a Family Medicine study shows, medical students are trained to avoid emotion. Even today, though, empathy is essential to practicing medicine in patients’ best interests. By its nature, clinical training leads to exhaustion and loss of empathy, as shown by Bellini, Baime, and Shea. Accordingly, a 2011 study in Academic Medicine found high burnout rates among residents. So, the first step in addressing patients’ anxiety is to recognize your own. Pay attention to your body’s signals, from a fast heart rate to tense muscles or indigestion. Then, practice patience, and take deep breaths before talking or taking action. Enter the patient’s room only after receiving permission. Introduce yourself with your ID upon entering. Shake hands with the patient. As a study in Hospitals and Health Networks shows, practitioners overestimate their politeness. So, err on the side of caution, and use these gestures to build a calming relationship. Communication remains key in patient-centered care. Therefore Epstein argues for the core competencies of interpersonal communication and professionalism. On the one hand, practitioners should listen attentively to anxious patients. On the other, you should ask patients how they are feeling and how to help them. In the process, practitioners should rely upon open-ended questions and patient-centered methods. Smith et al. shows that the end result is a stronger foundation for collaborative bedside medicine. When engaging with patients, put yourself in their shoes. Look at situations through their eyes, and beware your assumptions about their experiences. These biases may be conscious or unconscious, so it is important not to judge peoples’ behavior too harshly or too quickly. An International Journal of Caring Sciences article shows the results, with patients of empathetic doctors more likely to follow treatments, control conditions, and be satisfied with care. While inquiring about patients’ lives is a good start, you can also use humor to defuse anxiety. Making jokes narrows interpersonal gaps by showing that both patient and practitioner are human. Furthermore, as Bennett notes, humor relieves tension by allowing for patients to express their frustrations. So, although jokes should be used with care, laughter is yet another therapeutic tool for addressing anxiety. Avoid telling patients to relax; instead, ask how to help. Then, demonstrate relaxation techniques like deep breathing and mindfulness meditation. As shown by Michiyo, Haruko, and Sayoko, the latter can be used to both decrease tension and improve physical symptoms. You can also create calming conditions by dimming lights, asking visitors to step out, or offering tea or a warm blanket. Last, but not least, the many hand-offs of contemporary medicine make communication failures the cause of most errors. Such issues also fuel patients’ fears of this unfamiliar environment. Practitioners, however, can comfort patients by explaining each individual’s role on the healthcare team and each step in terms of the purpose behind it. In this way, coordination reassures patients at each step of care. These methods are all oriented around the foundation of bedside medicine: empathy. Addressing patient concerns in this way ensures the success of treatment. So, you can use theses techniques to supplement support and ensure successful overall care. Did you enjoy this article? Consider subscribing to receive similar ones. Snow melts, streams flow and baby bunnies appear to remind the world that another long winter has been put to bed. Spring has reemerged in Southern New Hampshire, and there is nothing like it anywhere else in the world. From festivals to fishing, hiking to seaside hotels, there is much to do see and and explore on the south side of the Granite State. No, this area doesn’t have a major league baseball team, but it is home to the Southern New Hampshire Penmen. Swing by the on-campus stadium in Hooksett and get your hardball fix. For many in the Granite State, springtime fun can be summed up in one word: golf. Southern New Hampshire offers a variety of great courses for golfers of all competitive levels, including the Manchester Country Club and Candia Woods. New Hampshire is known for its world-class fishing in large part to the quality and quantity of its lake trout–and the trout ponds open the fourth Saturday in April. Spring is a fabulous time for foodies. It’s when the weather begins to warm and the restaurants open their patios for the outdoor dining season. Find out when your favorite patios are planning to open this year. When it comes to hiking, Southern New Hampshire is sometimes overshadowed by the better-known trails up in the White Mountains. But the south side of the Granite State offers several hikes that are often overlooked by the masses, meaning you might have them all to yourself. When it comes to springtime outdoor activities, New Hampshire truly offers something for everyone–especially when it comes to biking. From recreational paths to untamed trails, you’re sure to find the right bike route for your family. Is June considered spring or summer? Either way, it can’t come soon enough for fans of the Manchester Farmers Market. It runs from 3 to 6:30 p.m. every Thursday starting in June through October. It’s also the perfect place to get your locally sourced fresh produce, meat, cut flowers, baked goods and more. There is a good reason the lilac is New Hampshire’s state flower. It’s hardy character symbolizes the wonderful people who founded the Granite State. That and the beautiful flower is ubiquitous across the area–and it blooms in the spring. It doesn’t really matter where you go in the south side of the state, you’re sure to see blooming lilacs if you’re traveling in during that time. If you’re like a lot of people, you’re ready to breathe in some of that salty air after a long, snowy winter. There’s no better place to take in the sites, sounds and smells of the Atlantic than the Hampton Beach boardwalk. There are restaurants, attractions and tons of fun things to do–making the boardwalk well worth the drive. You know it when you smell it. The smell of briquettes burning beneath a grill. The searing sounds of steak sizzling over an open flame. Horseshoes clanging, bottles clinking and frisbees flying through the air. That’s right, when spring swings through Southern New Hampshire, it’s time to get back to grilling and games with friends and family. There’s a lot to love about the south side of the Granite State–especially when the warm spring winds swing in from the west. Physicians – are you looking for more adventures to go on during your next free weekend? Check out our free adventure guide. Manchester is northern New England’s hidden gem. As the largest city in New Hampshire, it offers world-class dining, skiing, arts, and culture. From its settlement in 1722, New Hampshire’s Queen City has gone from a renowned mill town to one of the nation’s best and most affordable metropolises. One of the main reasons to move to Manchester is its central location within New Hampshire and northern New England. You can easily road trip to the neighboring states of Massachusetts, Maine, and Vermont, and Boston is less than an hour’s drive away. Manchester is also central to New England’s natural attractions, including nearby Uncanoonuc Mountains, the more distant White Mountains, and Atlantic seacoast. The city itself contains around 900 acres of beaches, pools, playgrounds, and other park lands, including sailing and running at popular Lake Massabesic. With around 60 inches of annual snowfall, the best approach to winter in south-central New Hampshire is to enjoy the white stuff. Follow locals to McIntyre Ski Area for skiing and snowboarding. For a winter getaway, head to the White Mountains, and enjoy some of the nation’s best skiing, tubing, hiking, and other activity areas. Interstates 93, 293, and the F.E. Everett Turnpike make it easy to get around – both in the city and around the region. The city’s Transit Authority provides bus service, and major airlines run through Manchester-Boston Regional Airport. A commuter rail is even expected in the near future. The city’s arts scene is on the rise, as shown on the trolley-based Open Doors Manchester tour. The world-class Currier Art Museum cannot be missed, including New England’s only public Frank Lloyd Wright House. Alternatively, head out on your own, and sample the city’s poetry at Slam Free or Die. Head to the local Farmers Market to experience fresh meat, produce, and baked goods from June through October. Even during the colder months, this city offers a surprising range of cuisines, including some of the best Nepalese, Mexican, and Brazilian food in New England. The Granite State has a growing reputation for craft brewing, and Manchester is home to some of New England’s best breweries and pubs. For instance, Strange Brew Tavern has received acclaim from Esquire Magazine and others for its 100 plus draft beers and delicious pub grub. Each year, the 11 academic institutions in Manchester bring in around 8,000 students. They can choose between Granite State College, Southern New Hampshire University, or New Hampshire Institute of Art, among others. Meanwhile, residents enjoy the many events and opportunities that these schools bring to the city. Opportunities for healthcare professionals abound in Manchester. In particular, the Bureau of Labor Statistics notes that Central New Hampshire has a high concentration of healthcare jobs and some of the highest wages in the country. Manchester has consistently ranked among the USA’s top places to live. This is due to low crime rates, strong transportation, and growing technologically-oriented economy. The city is also one of fastest-growing and most affordable places to live, according to CNN Money. Manchester provides all the benefits of living in the big city with the charms of a small town. From vacations at the beach to getaways in the mountains, you can experience the best that New England has to offer in this growing metropolis. Would you like a provider career in Manchester? Consider Elliot Health System. No work. No stress. And no worries. If you’re like most physicians, you can’t wait to get away from the hospital or clinic a few times a year. Perhaps you’ve escaped to the islands or traveled across the pond to explore Europe. Maybe you’ve dropped in on Disney World. This year, it might be time to stay close to home. No matter the season, the White Mountains offer something for everyone. There’s shopping in the summer, scenic drives in the fall, skiing in the winter and outdoor dining in the spring. Whether you’re into wildlife, water or a little fine dining, you can’t go wrong with a quick day trip to the hills. The White Mountain National Forest is less than a three-hour drive from Manchester, making it the perfect Monday getaway for your staycation. You’ll love exploring the historic White Mountains, the areas quaint villages and opportunities to see why people from all over the East Coast make annual visits to the region. When a well-respected lifestyle magazine recognizes a nearby lake as one of the “prettiest lakes in New England,” you’d be remiss not to seriously consider it among your staycation ideas. So why not take a drive over to Wellington State Park in Bristol and spend some time enjoying the local paradise that is Newfound Lake? You’ll love the scenic views of the hemlock-covered mountains, the crystal-clear water and the largest freshwater swimming beach the state park system has to offer. Learn more about Newfound Lake here. Now that you’ve enjoyed the serenity of the White Mountains and the beauty of New England’s most beautiful lake, it’s time to let loose and get serious about having some fun — especially if you have kids. Water Country over in Portsmouth has been entertaining New Hampshire families for three decades with its rides, slides, waves, rivers and pools. With 26 exciting acres of attractions, it’s the perfect way to spend a day burning off some energy during your summer staycation. By now you’re probably looking for something a little more refined and relaxing. On Thursday, make plans to visit the Currier Museum of Art in Manchester. It boasts a collection of 13,000 American and European works of art in nearly every medium, from modern to decorative to contemporary. It also offers a full range of studio classes so you can do more than simply appreciate art–you can create it. One of the best kept secrets about New Hampshire is that it’s an awesome place for foodies–and it’s small enough that you can eat your way through the state in a single day. Start with breakfast at the Friendly Toast in Portsmouth, which has been ranked as the best breakfast spot in New Hampshire. Then make your way over to Skinny’s Pizzeria in Manchester for a little lunch. Then finish your day by enjoying dinner at The Common Man in Claremont, where you’ll feel like you are a part of history in an old mill located along the Sugar River. Of course, there are many more great dining options in New Hampshire, so your Friday staycation ideas shouldn’t be limited to this list. There’s always something exciting happening in New Hampshire! Get out and enjoy the events! With the country in the throes of a physician shortage, jobs are plentiful in almost all specialties, clinics, hospitals and parts of the country. So why are so many medical doctors making their way to Manchester, NH? According to the Henry J. Kaiser Family Foundation, there are nearly 1,900 primary care physicians and more than 2,000 specialists actively practicing medicine in New Hampshire–and most of them can be found working in Manchester. Most physicians don’t practice medicine for the money, but compensation matters. In New Hampshire, the average physician compensation is about $300,000, according to a recent online article that ranked the top states in which to be a physician. That’s more, on average, than physicians are paid in Virginia, New York, Massachusetts and Maine. In addition, physicians in Manchester get to keep a larger share of their earnings because the state has no tax on wages. There is a lot to love about Manchester. It’s the state’s economic, social and cultural hub. With 110,000 people, it’s big enough to offer exceptional entertainment offerings yet small enough to allow physicians to play important roles in the overall health of their community. In addition, it’s safe, affordable and business-friendly. This all adds up to a high quality of life. It has been said that location is everything when it comes to buying a house — and Manchester, NH, has an ideal location. It’s just a short drive from some of the country’s premiere cities as well as the ocean, mountains and lakes. It’s 53 miles from Boston and about a five-hour drive from New York City. The Atlantic Coast is less than an hour to the east and the brilliant White Mountains and Lakes Region can be reached in just 90 minutes. Physicians who want to be near the action or the opportunity to escape love Manchester’s location in the heart of New England. With so many changes taking place in the healthcare industry, many physicians are seeking stability and support–both of which are abundant at Manchester’s hospitals, clinics and specialty care centers. Manchester healthcare systems have been consistently recognized as “HealthCare’s Most Wired” hospitals in the country by Hospitals & Health Networks magazine. They have been recognized by Nurses Magazine as some of the top places for nurses to work — and every physician wants to work with happy nurses. And they have been awarded the Press Ganey certificate for increasing patient satisfaction. This type of stability, support and focus on building a brighter future for physicians, nurses, other employees and patients make hospitals in Manchester great places for physicians to work. Manchester is one of those communities that truly allows physicians to use the full array of their expanded functions. It’s large enough to need trauma, cancer and urology centers, but small enough so that it’s largest hospital is a community hospital. This allows physicians to truly get to treat and care for patients who might otherwise be sent to specialty centers or seen only by specialists. Opportunity knocks often for physicians who practice in Manchester, NH. Are you searching for a new physician career opportunity? Consider Elliot Health System.